Not surprisingly, the English language has a plethora of words for money, especially slang words. After all, the more we talk about something, the more words we come up with to spice up the conversation. Here are a few of our words for that filthy lucre (which is from the King James translation of the Bible). money - from Old French from Latin, in which moneta was the mint, so called from a title of the goddess Juno Moneta, in whose temple coins were minted. 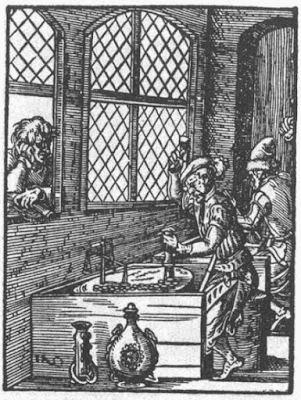 (By the way, mint itself comes from the same root.) Not until the early 19th century did money apply to paper bills as well as coins. currency - used in 1699 by John Locke to refer to the flow or current of money in the economy. cash - originally a money box in the 16th century, the secondary sense of the coins inside the money box took over as the sole meaning in the 18th century. bill - from the 166os, with a long history tracing back to Latin, of referring to receipts, formal documents, and official notices. spondulicks - mid 19th c, possibly from Greek spondylos, a seashell used as neolithic currency. buck - mid 19th c, a US dollar, possibly from buckskin as a unit of trade between Europeans and Native American Indians. 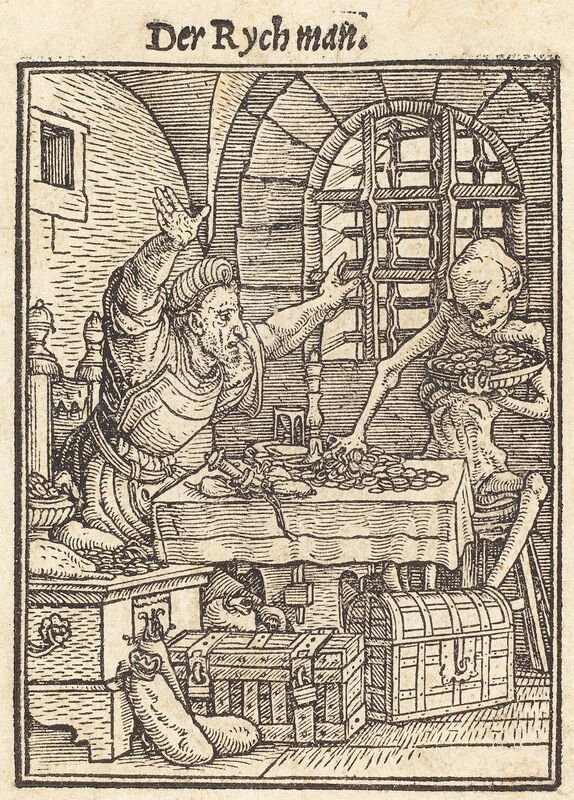 pelf - 1500, originally stolen goods, then booty or loot (now distinctly archaic). K - from kilo-, originally from the 1970s, but I suspect it really took off with all the talk about Y2K in the very late 20th c.
All these words clearly indicate a serious and abiding obsession with money, which is understandable, if perhaps not our noblest focus. On the other hand, many of these words are purposely a bit silly and probably serve to lighten money talk so that the speaker sounds more off-hand or less seriously concerned with money. News flash! Great glad tidings! My book of hours is now published and available on amazon! 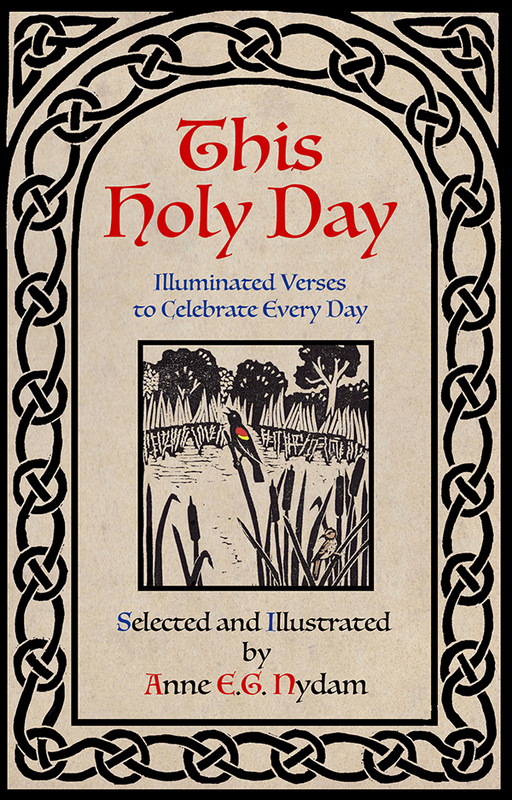 This Holy Day is just a little book, something that could be slipped in a purse or a desk drawer, or left in the car for some calm and beauty in times of rush and irritation. (But do not read while driving!) 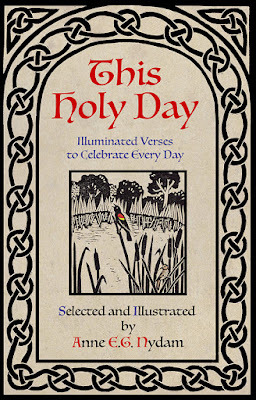 It includes a selection of short verses for each of my “canonical hours” through the day, although unlike a traditional book of hours, I expect these short devotional pieces will be dipped into and sampled a little more casually, rather than being assigned to a specific rule. (Previous post on medieval books of hours here.) The verses I chose range from bits of psalms and hymns to excerpts from secular poetry that seem to me to celebrate that same joy in the awesome beauty around us. I’ve also included a number of pieces I wrote myself over the years. Although of course the psalms come from the Hebrew Bible and the hymns are Christian, it is my hope that these words will resonate with people from a wide range of religious backgrounds and spiritual experiences. I believe that we’re all capable of connecting with that Spirit that is so much greater than any human understanding of it. 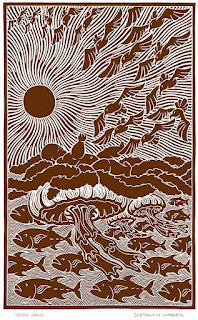 For the illuminations, the primary pieces are my series of rubber block prints representing the “hours” of the day. 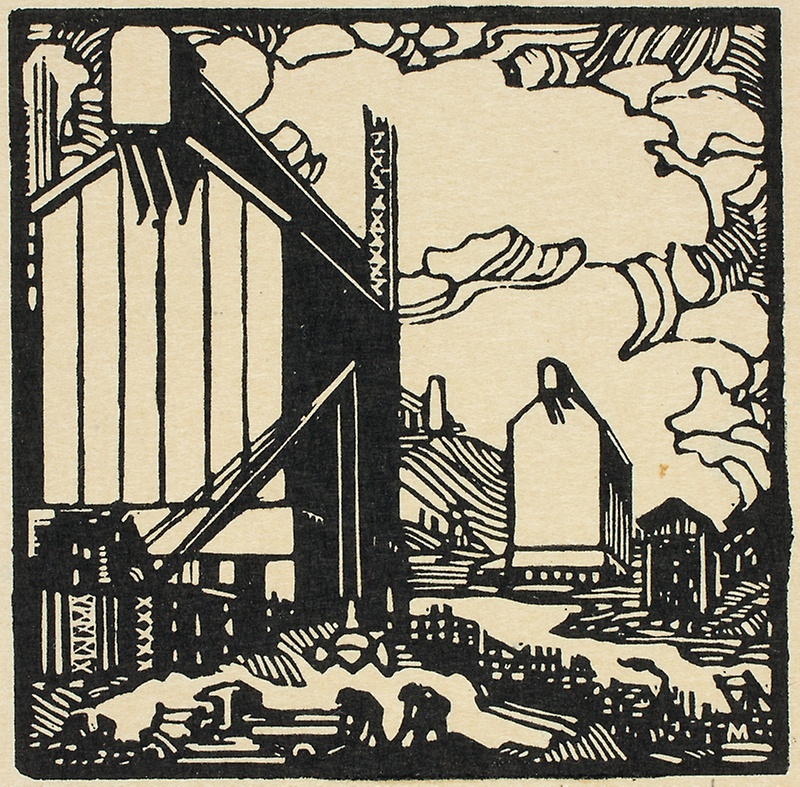 (Previous posts on the block prints here and here.) 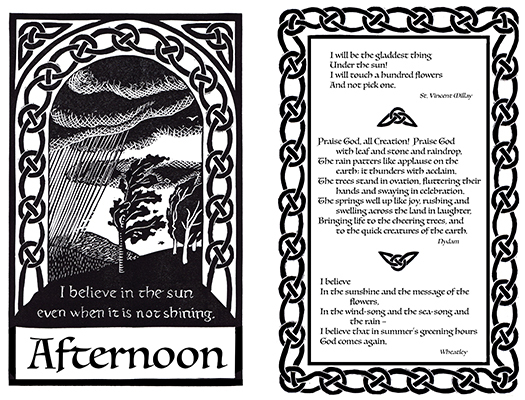 In addition to these I created a different border pattern for each hour, and a final double page scene inspired by the metaphor of being held by Love, or “the whole world in God’s hands.” I also used lots of my previous prints to illustrate and illuminate the pages throughout. I think it’s turned out really pleasing! And so now it’s freshly available on amazon. (I must say, I never imagined that I would be responsible for creating a book labelled “Self Help,” but that’s where amazon files it, since it’s the same category as “Personal Inspiration”. It kind of cracks me up.) As of now, the “Look Inside” feature is not active, but I hope it will be available before too long, and in the meantime, here are a couple of sample spreads so you can see how the pages are laid out. Finally, when you rush off to purchase copies for all your friends and family, please do so through Amazon Smile, to make sure that a fraction of your purchase price goes to the worthy cause of your choice (at no additional cost to you). After all, although my book focusses primarily on the natural world for inspiration, it is in human interactions that our inspiration should be playing out. Today is Bilbo and Frodo’s birthday, in honor of which let’s talk about the poetry that is such an important part of Middle Earth. J.R.R. Tolkien loved poetry and wrote dozens and dozens of poems related to Middle Earth, and one of the things that he did particularly well was explore a whole range of registers and types of poetry. He was, after all, a scholar and was familiar with the importance of poetry in pre-literate societies, when giving words rhyme and rhythm made it easier to remember and pass on everything from riddles to epic history. 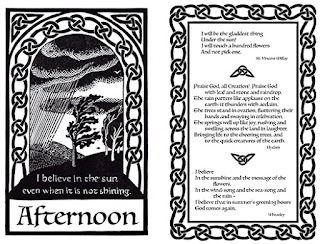 Tolkien’s own poetry included casual snippets and entire long lays, elegant hymns, rollicking drinking songs, and somber laments. He wrote marching songs, humorous ditties, prophesies, mnemonic lists, love songs, ballads, reimaginings of nursery rhymes, praises, elegies, trash-talking challenges, and more. His characters knew and used poetry in all aspects of their lives, as real people really do. (If you don’t believe me, revisit my previous posts Poetry is Everywhere.) This idea of the wide variety of poetry in culture was extremely influential to me and inspired me to try writing many different types of poetry for my own fantasy Otherworld. It’s a fun and challenging exercise that ensures you don’t end up making all your poems sound the same! 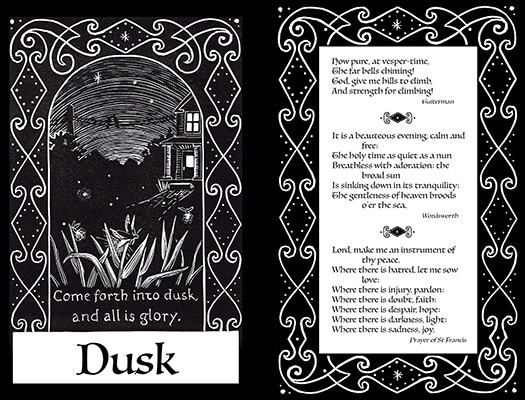 As for Tolkien, here are a few samples of his poetry that I especially like. This one is more fun for its content than its actual poetry, but it’s a touchstone for all things Lord of the Rings, and fun to adapt and play off of, too. Today, as promised, I have some work by the husband of the previous artist featured. John J.A. Murphy (USA, 1888-1967) was married to Cecil Buller, and both were active printmakers. They shared a somewhat similar style in portraying the human body, stylized, with different areas modeled and shaded boldly. 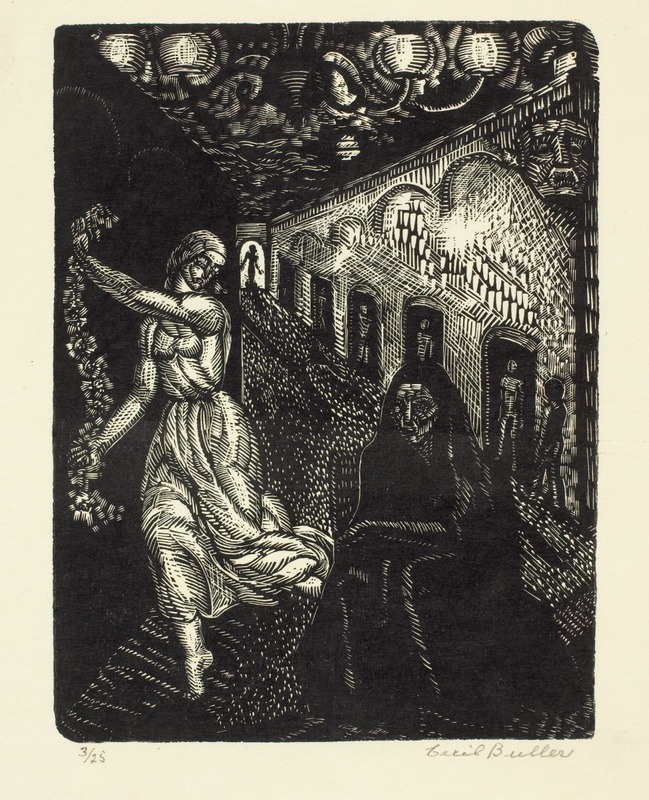 They both made series with Biblical themes, Murphy illustrating the Stations of the Cross, among other things. But as with Buller, Murphy’s bodies aren’t my favorites, and I’ve chosen pieces I like more. 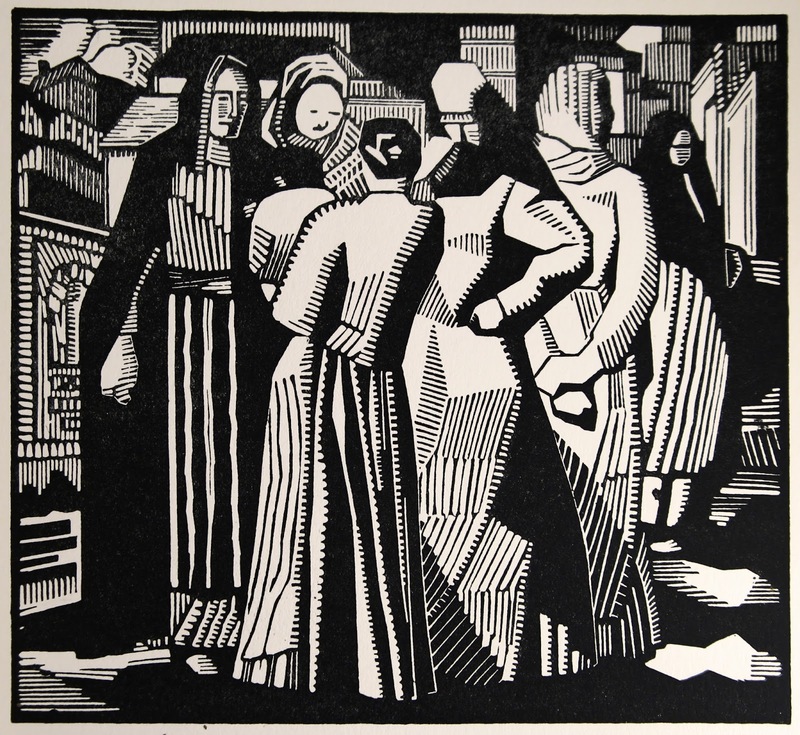 First, “The Morning Gossip,” which looks like a simple gathering of women chatting pleasantly, until you notice the figure on the outskirts in a black shawl, staring at the group of which she is not a part. And the woman nearest her turns and looks over her shoulder. Is it a warning to stay away? Is it guilt? Some of the other women have interesting expressions, as well, considering how simple their faces are. 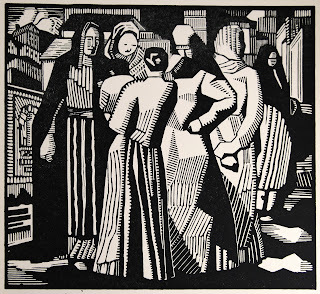 I also like the variety of stripes on the women’s skirts, giving them interesting texture and an almost Cubist angularity. This piece is pretty intense. 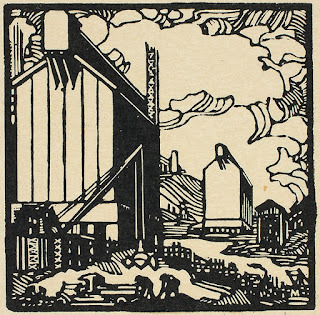 as wood engravings, and although their carving style does not look at all like engraving to me, they are quite small, only about 3 inches square. I like how bold they are and how grand their views for such small images. Cecil Buller (Canada, 1886-1973) is half of another block printing couple, and I’ll feature her husband next post. As with my previous couple, the Zorachs, Buller and her husband have many similarities in their styles, but for now we’ll just look at her on her own. One of her most famous projects was a series of illustrations for Song of Solomon, which naturally features lots and lots of embracing nudes. In fact, Buller loves her nudes altogether, and her nudes are very characteristic of their time as well as her style. They are very stylized, with lots of musculature and almost lumpiness of anatomy, as their bodies are composed of many areas, each formed and shaded with many strokes. I confess to not being a huge fan, so the pieces I offer you today are those that stood out to me as being a little different and more appealing. 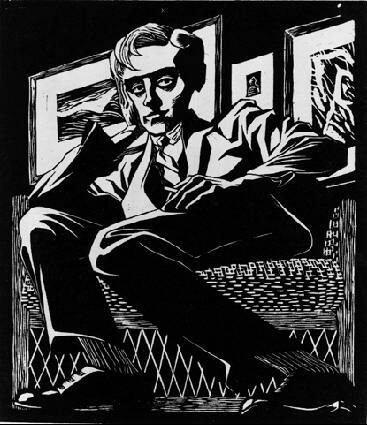 First up is representative of some of Buller’s more expressionistic work. It seems very symbolic, with its white-gowned maiden and black-robed crone. I like the way the maiden’s garland is composed of such simple strokes with the multi-line tool, which yet so clearly resolve themselves into flowers. I like the chandelier floating above like a celestial constellation instead of a light fixture. I like the variety of marks and textures forming the different areas, especially the wall along the right, with all its doorways for entrances and exits. 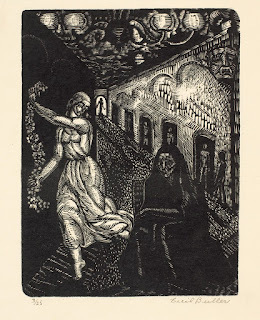 I also have two of the illustrations from Song of Solomon. 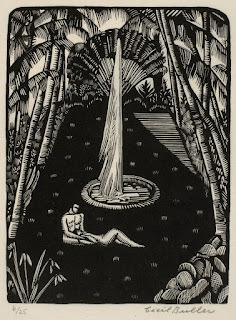 The first is what you might expect: the lovers in a beautiful garden in some secluded paradise. They take pleasure in each other’s company among the palm trees beside a fountain. It all looks very plausibly Biblical, despite the presence of that wonderful tropical traveller’s tree (ravenala) which is native to Madagascar and therefore presumably unknown to King Solomon. 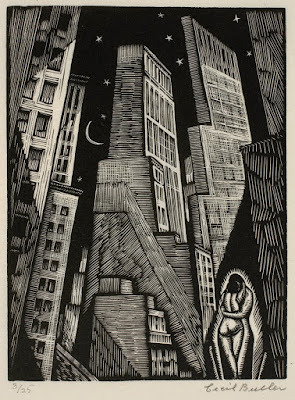 On the other hand, perhaps Buller was very consciously placing her lovers in a non-Biblical setting as she did in this second illustration set in a city. I really like this one (despite the danger of arrest for indecent exposure.) 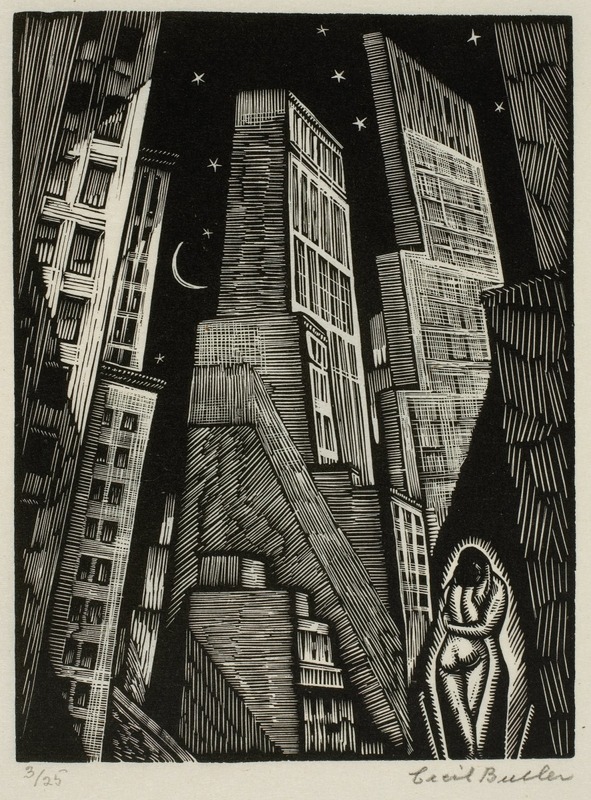 I love the perspective of the skyscrapers towering over the viewer, the different facets of the buildings, the bright night sky, and the lovers glowing together in the darkness. A classic motif in mythology and fantasy is the magical sword. This is hardly surprising, given the importance of swords to so many cultures, and the incredible skill required to craft a good sword. Any high-quality blade must have seemed pretty magical in the early days of metallurgy, and when might makes right it is not unusual for that might to be given mythologies to justify it further. Magic swords sometimes have magic powers of their own, sometimes confer magic powers on those who wield them, and sometimes have sentience so that they almost wield their warriors. In many cases the swords have names to further enhance their special identity. Let’s take a look at a few of the world’s famous magic swords. Tyrfing - In Norse mythology this sword would never rust, never miss a stroke, cut through iron and stone, and shine like fire. It was also cursed so that it would kill a man every time it was unsheathed, and cause three great evils. Similar Norse swords Dáinslief gave wounds that never healed, but had the same sort of curse, and Mistilteinn that could never be blunted. 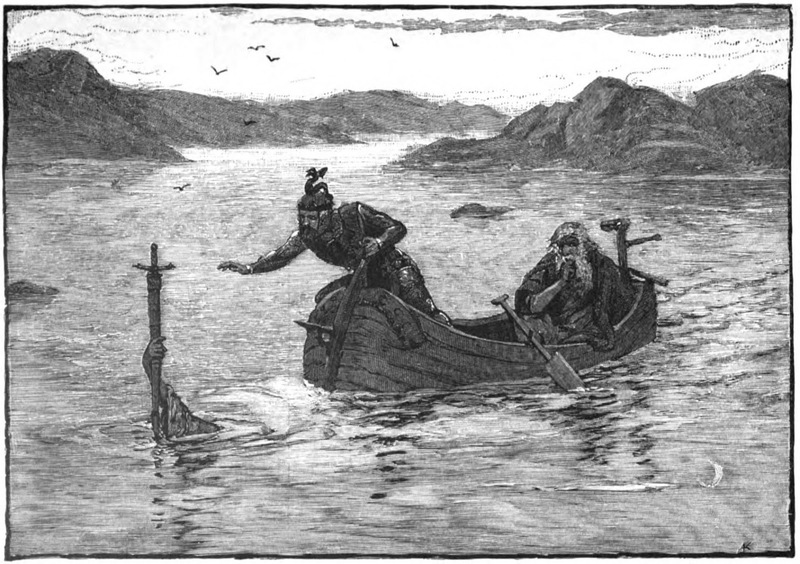 Hrunting - Beowulf’s sword was annealed in blood and was said never to fail a blow. Of course, it did fail when Beowulf confronted Grendel, much to everyone’s surprise (except possibly Unferth, the sword’s previous owner. 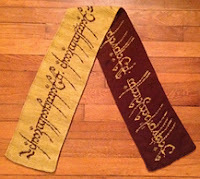 Some scholars contend that he gave it to Beowulf knowing it would fail.) In any case, I guess that doesn’t leave Hrunting looking very magical after all. Asi - In the Mahabharata, Asi was created by Brahma for the destruction of evil. He made first a terrible monster, deep-blue, tall and skinny, with sharp teeth and incredible energy and power. That creature then assumed the form of a blazing sword. Nandaka - Vishnu’s sword is a flaming sword of knowledge, destroyer of ignorance. 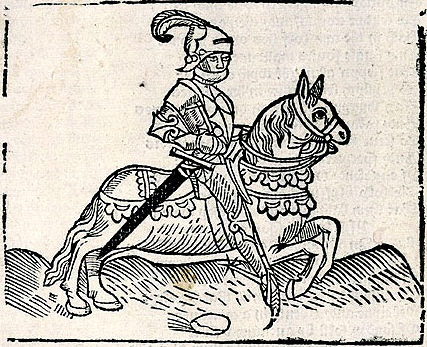 Durendal - Roland’s sword, which contained a variety of saintly relics worked into it, was the sharpest sword in existence, could cut through boulders, and could single-bladedly hold off an army of a hundred thousand Saracens. It was also indestructible, which turned out to be a problem when Roland wanted to prevent it from falling into the wrong hands. In the end he threw it into a cliff in Rocamadour, France, which it sliced right into, leaving it poking out of the rock to this day. Kusanagi - In Japanese legend, Kusanagi was found in the tail of an eight-headed monster, and turned out to have the ability to control wind. It is officially part of the Imperial Regalia of Japan, although it has not been seen since about the fourteenth century, except by some priests in the Edo period (1603-1868) who all subsequently died of strange diseases, except one who survived to tell the tale. Tizona - One of El Cid’s two magical swords, Tizona was said to have a personality, though what sort of personality I don’t know. On the other hand, its strength varied according to who wielded it, which seems to me the very opposite of magical. After all, isn’t the most ordinary kitchen knife more powerful in the hands of a more powerful warrior? Shamshir-e Zomorrodnegar - In Persian legend this sword originally belonged to King Solomon. 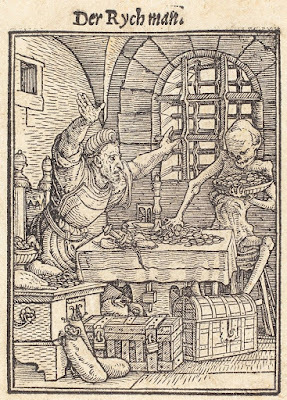 It was later in the possession of a horned demon named Falud-zereh partly because wearing it was a charm against magic, partly because a wound from its blade could be cured only by a special, complicated potion, and partly because Falud-zereh’s witch mother had charmed him so that he was invulnerable to all weapons except this one. Presumably this is a case of keeping your enemies close. It sounds a little chancy to me, and I don’t know exactly how the story ends, but I can only assume Shamshir-e Zomorrodnegar did its job. Video games include a vast array of magical swords, which are so common as to be taken for granted by every player at every level. Some of the more famous in their respective mythologies, however, include “The Legend of Zelda”s Blade of Evil’s Bane which had all sorts of powers, “Prince of Persia”s Dagger of Time which had a variety of timey-wimey powers, “Ultima”s Black Sword which contained the power of a demon, and “World of Warcraft”s Frostmourne which could steal souls. 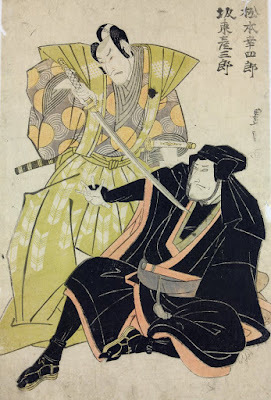 While it’s easy to see why long ago the weapons of special heroes were credited with special powers, we clearly continue to have a fascination with magical swords, long past the days of practical sword use. (You’ll note that there are far fewer named, magical firearms in our modern mythologies.) I think it’s because the trope allows us to explore ideas of where power comes from and how we can choose to use it - or be used by it, what it might be like to have supernatural abilities and the implications thereof, and, ultimately, what makes a hero a hero. What powers would you most like to see in your vorpal blade? What kind of sword would you wield? Would you use it for slaughter, or give it other magical abilities instead? Personally I’m pretty intrigued by the possibilities of the power to slice through ignorance. 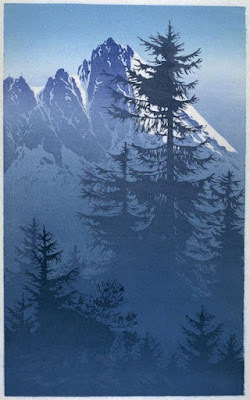 Here’s a charming wood block print by Li Qun (China, 1912-2012). 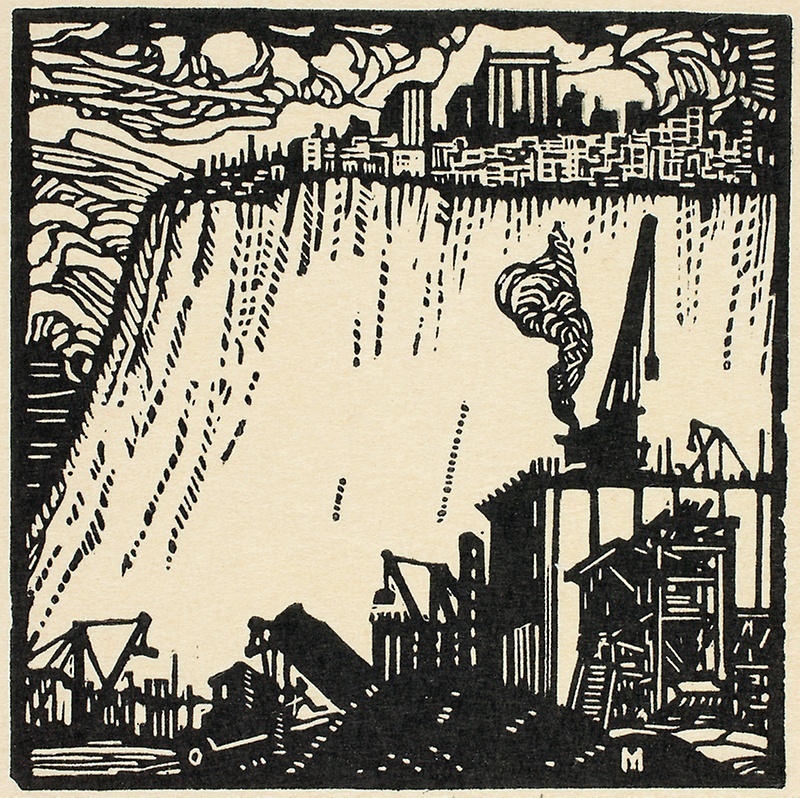 Li Qun was one of the foremost block print artists in China for nearly a century, and over that time he demonstrated a variety of styles and techniques. As a good communist, much of his work focused on the workers and soldiers, but this one with a simple nature theme is especially delightful. The carving looks a little rough, with the wiggly edges to the squirrels and tree trunks, but that’s a bit deceptive. All the tiny white spaces among the incredibly detailed branches must have been quite time-consuming and difficult to carve. 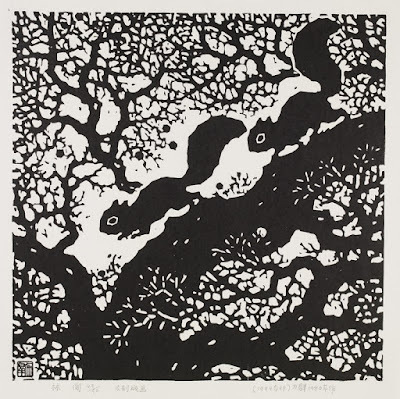 There’s also something quite interesting about the white twigs on a black background: they’re carved with individual little disconnected strokes instead of being continuous lines. 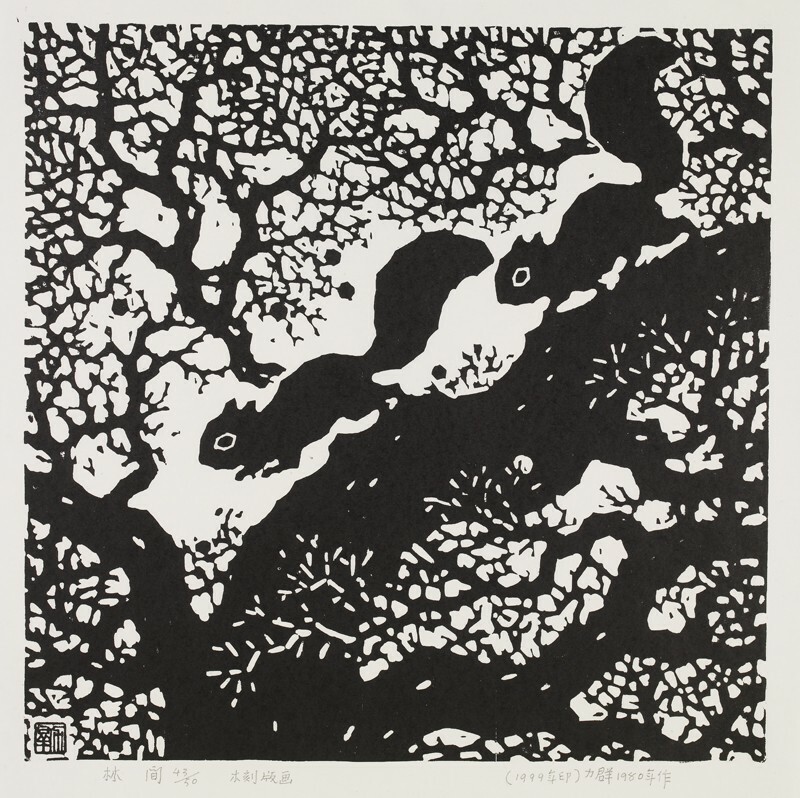 Another interesting discontinuity about Li Qun's art is that it appears that much of his work was not printed until long after it was designed. This piece, for example, was designed in 1980 and printed in 1999. I’m not sure what to make of this information. First of all, is the carving defined as part of "designing" or part of "printing"? 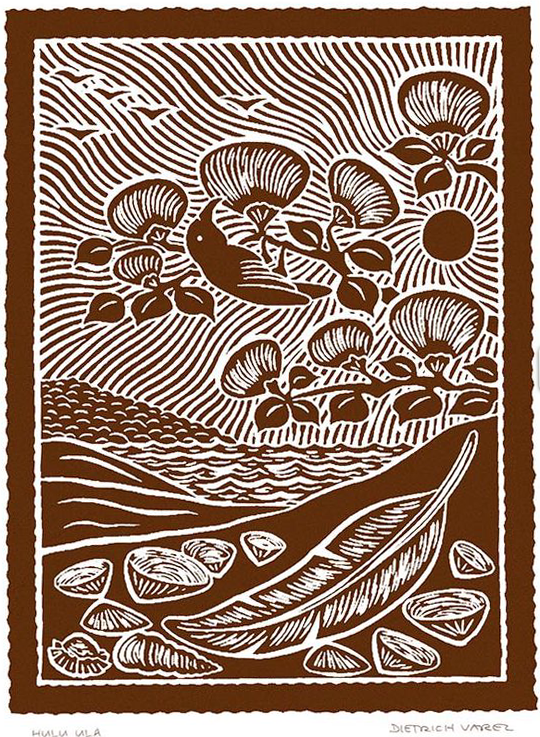 Because I think of designing as drawing the design on paper, and printing as inking the block and pressing, while carving is its own thing in the middle. And secondly, does it mean Li Qun began pulling impressions immediately, but kept going for twenty years? It isn’t an open edition, but he could have printed new impressions only as the older ones sold. Or did he for some reason set his blocks aside for years before printing them at all? It’s very strange. At any rate, this seems like a good late autumnal scene, with its leafless tree and scampering squirrels, and it makes me happy on this lovely early autumn day. I’ve just been reading some advice on editing one’s own work, and as editing my own work is something I do a lot of, I’m always happy to see tips from anyone who has some wisdom to share on the topic. This particular article, however, hit one of my buttons so hard that I simply can’t help myself from gnashing my teeth and making this post a rant. That’s a question: How much better is this sentence? And the answer the author provides is: Clean and simple. Saunders refers to his hypothetical as “Hemingwayesque” in its brevity and simplicity. But my answer is emphatically the opposite. “Jack entered the room” is a stupid, useless sentence. If that’s all the author’s going to give me, the entire novel may as well read “Jack entered the room. Jack shot Jill. Jack felt bad. Jack developed an alcohol dependency. The End” Clean and simple! Such brevity! Such complete lack of interest or engagement. Of course I care if Jack was in a huff! Of course I want to know about the old green recliner. That old green recliner tells us an enormous amount about where Jack is and what world he lives in, and if we happen to know that the recliner is Jack’s own chair, it begins to tell us quite a bit about Jack himself, too. It’s true that in our hypothetical single sentence example, we don’t know what else the author has already told us. If I can learn about Jack’s mood through his actions or what he says, then perhaps the huff is trimmable fat. If I’ve already heard the description of the room and its furniture so that I can picture Jack there in my imagination, then perhaps the old green recliner is trimmable fat. But in the absence of the rest of the hypothetical story, this advice, like so much other writing advice, assures us that all description is fat, that readers don’t want to picture a world or know a character, and that of all the elements of story (character, setting, conflict, plot, and theme) plot is the only one that isn’t fat. Again and again we’re told that to write descriptively is heinous sin. (For more on this you can revisit my previous rant In Defense of Purple Prose.) I presume that description is supposed to be bad because readers are supposed not to like it, but that is certainly not true in my experience as a reader of books I love, nor as someone who has spoken with many people, especially children, about the books they love. It is, indeed, so far from being true that it makes me wonder whether this writing advice is even intended to make books for actual readers. I begin to suspect that the idea is simply for all the Hemingwayesque writers to be able to sit around congratulating themselves on their Hemingwayesquity, while sneering down upon all the poor, stupid readers who simply wanted to be able to immerse themselves in a story with well-rounded characters in a deep, vivid world. 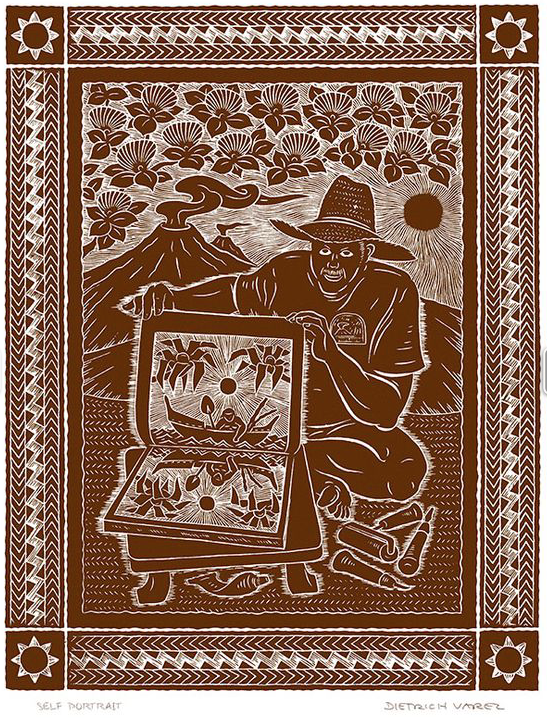 Dietrich Varez makes wood and linoleum block prints celebrating the history, nature, and mythology of Hawai’i. 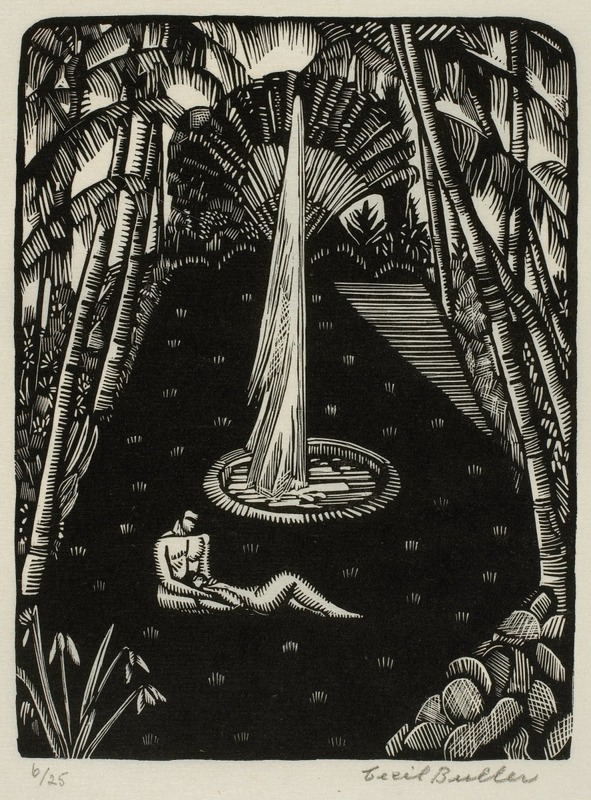 When I came across his work this morning I immediately recognized it from a trip to Hawai’i some 10 or 15 years ago. 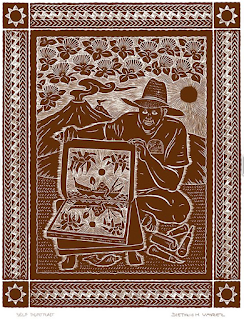 He has a very distinctive style: always printing in brown, filling backgrounds with stylized patterns, often incorporating borders and motifs inspired by traditional Polynesian designs, especially Hawai’ian two-color quilts. In all of the examples I have here I like the wavy rays of the sun filling the sky. Together with the sun being dark instead of light, it’s almost a physical presence. Clearly this is a handling of the sky that Varez returns to, but in other examples he uses other patterns, and more rarely plain white. 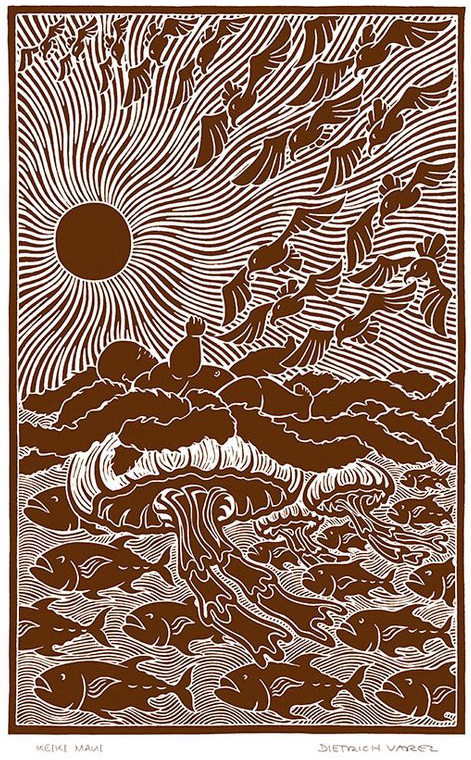 The jellyfish in today's first piece are especially fun, and if you look closely you can see that the large jellyfish is wafting the baby Maui along the ocean like a cherub on clouds. I particularly like the self portrait, which seems a little more personal than many of Varez’s other images. 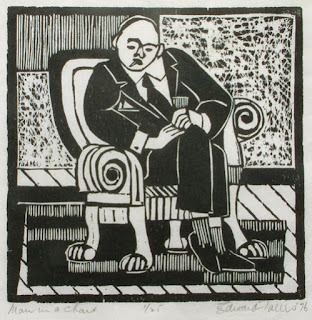 It’s also an illustration of printmaking process, as Varez shows himself with brayer, blades, and ink, pulling a new impression from a block. In the background, flowers fill the sky above the fuming volcanoes. The last piece may be my favorite, though: a pleasing composition and patterns for a simple but pleasing subject of nature. common people.” On the other hand, unlike me, Varez doesn’t limit his editions, but just keeps printing and printing, often until the block wears out! He also seems to be a bit of a recluse. At any rate, he’s found his niche and stuck with it, and it seems to be a very popular niche, too.